Mort Künstler Hand Signed and Numbered Limited Edition Print:"Race Down Chester Street"
Edition Size: Artist Signed and Numbered with COA to 350 prints with 50 AP's. Canvas limited to 50/15/5. Medium: Fine Art Prints on Paper and Giclee on Canvas Editions. Image Dimensions: Limited Edition PrintImage size: 18" x 27" /Overall size: 23" x 31". Canvas Sizes 21" x 32", 26" x 40" and 39" x 60". 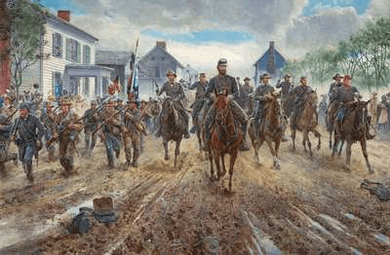 About the Art: To this day, one of the most heralded campaigns in American military history remains General Thomas "Stonewall" Jackson's Shenandoah Valley Campaign of 1862. One of the most pivotal engagements of that campaign took place in Front Royal, Virginia where Jackson's troops were not only able to divide, but also to rout a much larger Union force. He was then able to push his enemy's withdrawal even further by striking at its flank and threatening its rear formation. Many experts believe that this move led directly to the defeat of Major General Nathaniel P. Banks' army at the First Battle of Winchester, two days later on May 25th. As a brilliant and cunning tactician, Jackson had deceived his enemies into believing that he had positioned his army down in the Shenandoah Valley near Harrisonburg, Virginia. Instead, he ordered a quickstep march through New Market and the Massanutten area, to the Luray region, where he swiftly advanced on Front Royal. This maneuver placed him in a perfect position to advance directly toward the rear of the Union Army. The capture of Front Royal also threatened the Federal lines of communication. The Union infantrymen quickly evacuated the town and fled north from Strasburg towards Winchester. As they withdrew down the Valley Pike, they were attacked repeatedly by Jackson's cavalry and artillery, setting the stage for another engagement the following day, where once again, the Confederate forces emerged victorious. A vigorous pursuit of the fleeing Federals was hampered by a mismanaged cavalry and an exhausted infantry. Nevertheless, Jackson was able to drive Banks' army back toward the Potomac River, where it retreated nearly 35 miles in a single day. After relieving the town of Winchester from the threat of Federal occupation, he rested his men in preparation for a series of victories that were still to come. Mort Künstler's Comments On October 9, 2011, we unveiled the painting "On to the Shenandoah!" in Front Royal. This date was a significant one, the 150th Anniversary of the Warren County Courthouse. The piece we revealed there depicted "Stonewall" Jackson in front of the courthouse during the Battle of Front Royal on May 23, 1862. I announced at that time that the painting would be the first in a set of two images pertaining to the battle. This second painting, The Race Down Chester Street, is the anticipated sequel. It is exactly the same size as the first piece, with many of the same cast of characters. This depiction, however, takes place about fifteen minutes later in the engagement. After being slowed down by Union resistance at the Courthouse (as depicted in "On to the Shenandoah! "), Jackson led his troops in a race to the bridge across the river in an attempt to cut off the Union troops who were in retreat towards Winchester. The composition for this follow-up gave me a perfect opportunity to paint historic Chester Street, almost in its entirety. I had painted 29 Chester Street once before in 1999 for a piece titled Covered with Glory. That painting featured the 26th North Carolina marching north, with the apartment building as a backdrop. In this new painting, I took a viewpoint as if I were standing in the middle of Chester Street looking south. In the very far background is the same apartment building, also known as the Boone. The next building, closer to the viewer, on the left side of the street is the Balthus House with its distinctive windows on the third floor directly behind the flags. Closer still is the Balthus Barn with its blacksmith shops and stables. Across the road at 54 Chester Street is the Dorsey House, with the largest outside chimney in town. The nearest white building on the left is the venerable Ivy Lodge, an architectural gem surviving on the oldest street in town. Today it serves as a museum and headquarters of the Warren Heritage Society. The executive director of that society, Patrick Farris, has been of immeasurable help in unearthing all of these facts. When composing the characters, I deliberately silhouetted "Stonewall" against the sky and used the perspective lines of the buildings to lead the eye to him. The wagon tracks and puddles serve the same purpose, helping to create a strong center of interest. As the general and his staff race toward the bridge, Colonel Bradley T. Johnson, the officer on the extreme left, leads the 1st Maryland CSA on foot. Although Jackson could not cut the Federal forces off at the bridge, he succeeded in chasing them right through Winchester, where he and his army were welcomed like conquering heroes. Perhaps the most significant aftereffect of Jackson's victory at Front Royal was the decision by Abraham Lincoln to redirect 20,000 Union troops to the Valley in an effort to stop him. They would not.